This paper presents a Hidden Markov Model based walk synthesizer, where the velocities of the synthesized walks are interpolations of the walk paces present in the training database. In a first stage, Trajectory Hidden Semi Markov Models (THSMM) of gait are trained for different subjects and different velocities, using a database of motion capture walk sequences. In a second stage, the parameters of the individual speed models are interpolated in order to synthesize walks with speeds not present in the training database. 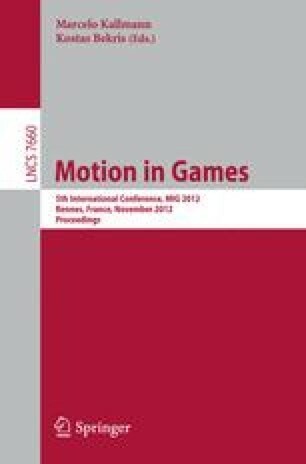 A qualitative user evaluation of the synthesized sequences shows that the naturalness of motions is preserved after linear interpolation and that the evaluators are sensible to the interpolated speed of the motion.